A Chinese People's Liberation Army soldier stands guard in front of 'Unit 61398,' a secretive Chinese military unit on the outskirts of Shanghai, on Tuesday. The unit is believed to be behind a series of hacking attacks, a U.S. computer security company said, prompting a strong denial by China and accusations that it was in fact the victim of U.S. hacking. BEIJING -- China's military on Wednesday responded angrily to accusations by an American computer security company of systematic hacking of U.S. business and military interests, arguing it "lacked technical proof and was "not based on fact." 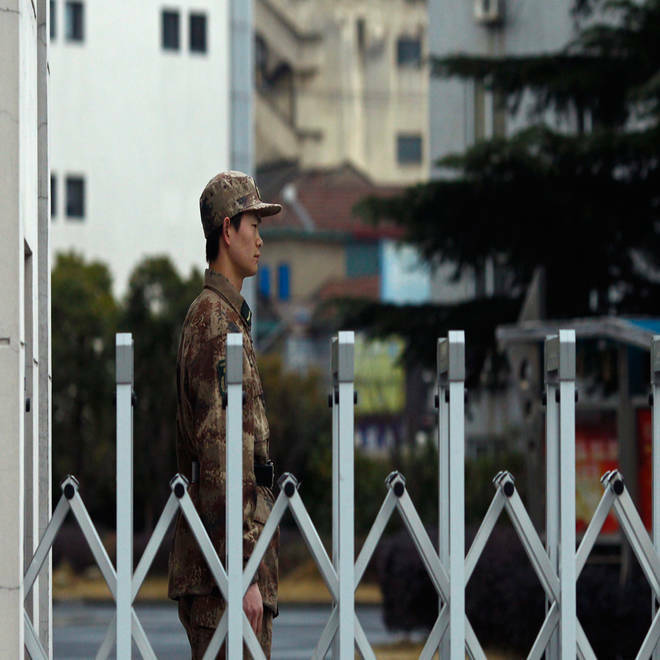 In a statement published on the Chinese Defense Ministry's website in response to the controversial report by Mandiant Corp., the military denied the charges, arguing the data was not enough to connect the hacking to them. "The report, in only relying on linking IP address to reach a conclusion the hacking attacks originated from China, lacks technical proof," the ministry wrote in its statement, "Everyone knows that the use of usurped IP addresses to carry out hacking attacks happens on an almost daily basis." The ministry also argued that there was no globally accepted definition of what constitutes hacking. NBC's Kristen Welker has more on what the White House may be planning to do about foreign agencies hacking into U.S. trade secrets. "There is still no internationally clear, unified definition of what consists of a 'hacking attack'. There is no legal evidence behind the report subjectively inducing that the everyday gathering of online (information) is online spying." The Defense Ministry said that China itself is a frequent victim of hacking, a common theme in China's rebuttal of accusations of foul play in cyberspace. The ministry said it had tracked a "considerable number" of attacks against its networks that originated in the United States, but it noted that those intrusions had not been used "as a pretext to accuse the U.S. side [of hacking]." The statement came a day after Mandiant released an explosive report, first detailed in a New York Times article, that tied a People's Liberation Army unit based in Shanghai to a prolonged and focused campaign of stealing corporate and defense trade secrets. According to Mandiant, the Chinese hacking unit, believed to be "PLA Unit 61398," employed hundreds, perhaps even thousands, of operatives to raid secure American servers, extracting trade secrets, blueprints, pricing data and other valuable information. In total, Unit 61398 was said to have pillaged hundreds of terabytes of information from 141 companies -- 115 of which were American -- representing 20 industries in a variety of fields including telecommunications and defense. The hackers reportedly used techniques such as "spear-phishing" -- using spoof e-mails to trick users into granting access to internal servers -- demonstrating a strong proficiency in English and advanced understanding of computer security and network operations. China pointed out that its Ministry of Public Security had assisted more than 50 countries and regions in investigating cybercrime cases and that the Beijing had entered into a number of bilateral law enforcement cooperation agreements with those countries to help combat hacking. The Mandiant report and the media maelstrom around it prompted Chinese state media to lash out at the hacking accusations, though the Chinese-language version of the New York Times story was still blocked in China. China's typically nationalistic newspaper, Global Times, said Beijing should be more vocal in exposing hacking attacks conducted against China. "Some officials have been punished for internally reporting that government websites have been hacked and secrets leaked, but almost no details have come out," the paper wrote.